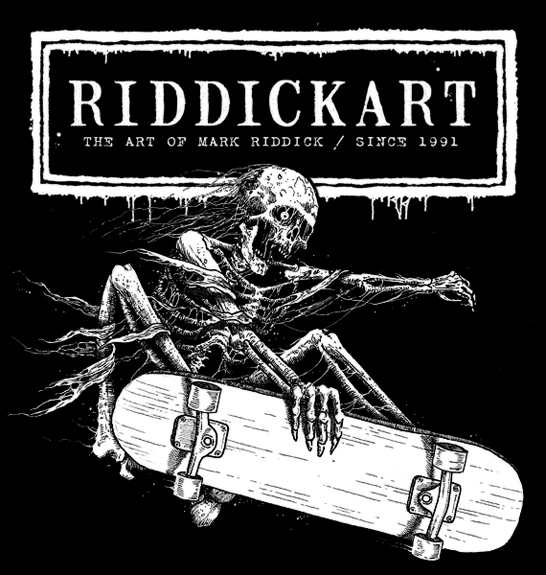 We love us some Mark Riddick (remember when he was kind enough to grant us an interview? 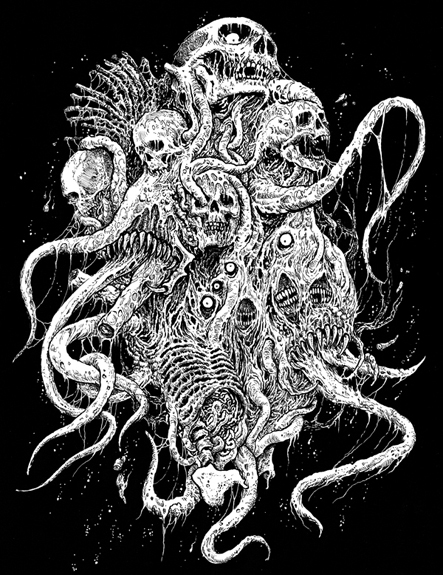 ), so we were stoked to see some of his new death metal designs come through our presses. 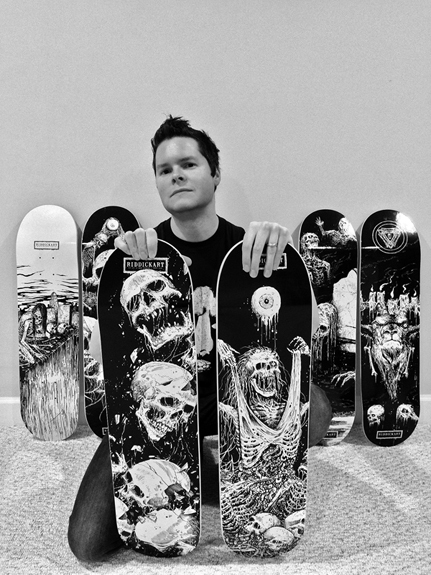 These latest BoardPusher.com Featured Decks from Mark are now available at BoardPusher.com/shop/riddickart. 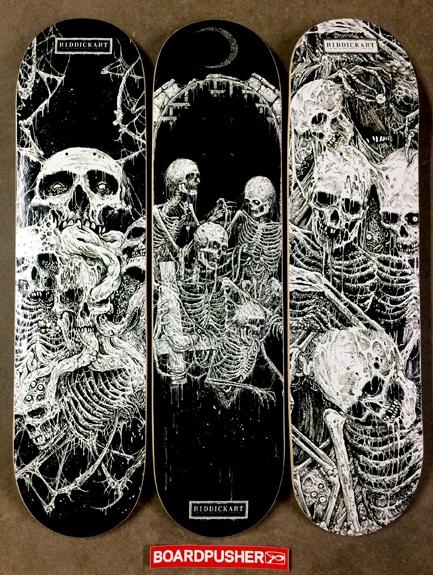 We have thousands of designs to browse, so you’re bound to find your new favorite skateboard artist at BoardPusher.com/shop. 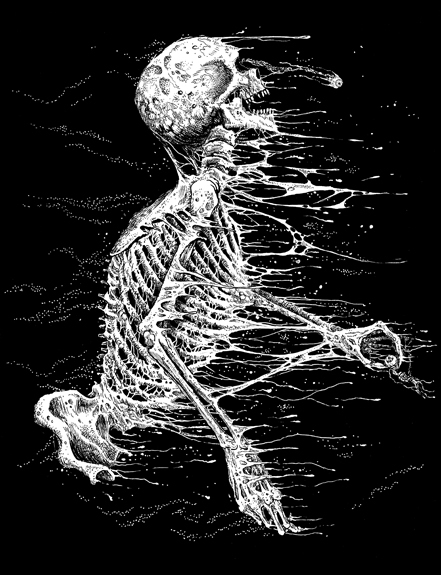 The name Mark Riddick is synonymous with “death metal art” (seriously. Google it). He has been a staple in the genre and industry for a couple of decades now, and when we started seeing his art come through our presses a few years ago we were in awe of his gruesome and intricate designs. Since underground music and skateboarding have long been intertwined, we navigated The River Styx and snuck some barbiturates into treats for Cerberus (i.e. traded emails) for an opportunity to get Mark’s veteran take on the marriage of the 2 subcultures as well as get some insight into his creative process towards his skateboard graphics. Do you create a specific setting when you sit down to draw? It’s really quite difficult to create a setting these days. I’m very preoccupied by familial obligations so I essentially draw anywhere I can. Lately I’ve been using my dining room table as a place to catch up on freelance illustration work. I also make a point to go to my local Starbucks to take 2-3 hours to draw as soon as they open on Sunday mornings. This gives me a chunk of time without distractions to focus on my work. I have a home studio, but I really only use it to do emails and related administrative stuff that goes into being an artist. We were kind of hoping that there would be a dark dungeon with several candles burning while haunting chamber music and somber chants floated through the room, but I guess Starbucks has its own aura of evil. Well, my studio space is decorated by a vast collection of framed original illustrations by some of my favorite artists and inspirations. I’m also surrounded by numerous cassettes, vinyls, reference books, and replica skulls. How large do you make the original file/canvas? All of my original work is created on 8.5” x 11” letter size printer paper, nothing extravagant. I try to keep things as simple and old school as possible. It’s a way for me to keep things true to the underground way of doing things. That raw do-it-yourself approach is a key component to my working process. How do you go about transferring an 8.5” x11” letter size drawing into a 9” x 33” skateboard graphic? All of my illustrations are scanned in at a high resolution (600dpi) which helps in maintaining the quality of the reproduction when my work is transferred to a skateboard deck canvas. Is there a particular reason as to why your designs are strictly black and white? My strict use of black and white is a throwback to the early 90s, when I started illustrating for underground heavy metal bands and fanzines. Everything was done on a photocopier: fanzines, demo covers, fliers, etc., so it was important to keep things black and white because color copying was a new and expensive technology at the time. I’ve held true to the black and white approach. It’s essentially become a part of my branding as an artist. What were some of the ‘zines that you contributed to? Were there any other ‘zines you checked out regularly? I contributed to several underground fanzines in the past, mostly short-run photocopied fanzines that most people have probably never heard of. The only newstand ‘zines that I contributed to included publications like Pit Magazine, Inner Source, World of Fandom, etc. I’ve also had my work showcased in a few of the well-known glossy metal music ‘zines like Zero Tolerance, Terrorizer, Metal Hammer, Legacy, etc. At this point in time I don’t often read magazines unless they’re underground or feature some bands I’m into. Some of the fanzines I’ve read recently include Reborn from Ashes, Headsplit, Soulgrinder, Bells of Acheron, Compilation of Death, Crypts of Eternity, etc. What initially drew you to the gruesome style of art? My passion and interest in extreme music: death metal, thrash metal, and black metal have driven me in this direction. I’ve been illustrating for these genres for 25 years and the subject matter tends to be on the darker and less conventional side of life. A lot of musical discoveries come from the world of skateboarding be it skate video parts, skate mag record review sections, or that one skater friend who is deeply connected to the underground subculture. 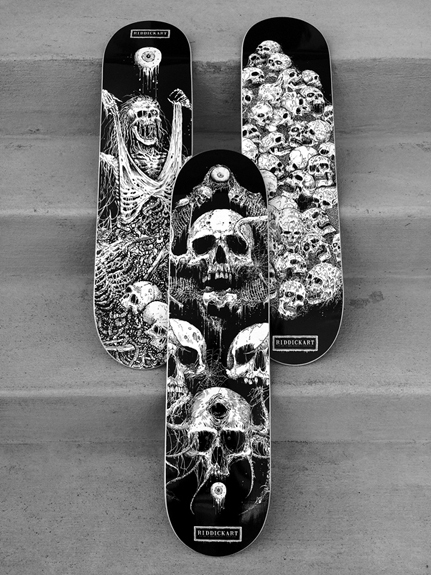 Do you also see a connection of death metal and death metal art to skateboarding and what was your introduction to skateboarding? What was your introduction to death metal? Yes, I believe that heavy metal art and skateboard art have some parallels. They both borrow from extreme subject matters and visuals at times. Both are more or less subversive cultures in and of themselves so there is a shared similarity there. My introduction to skateboarding was in my very early teens, however I never exceled in this area and my skateboarding days were relatively short-lived. 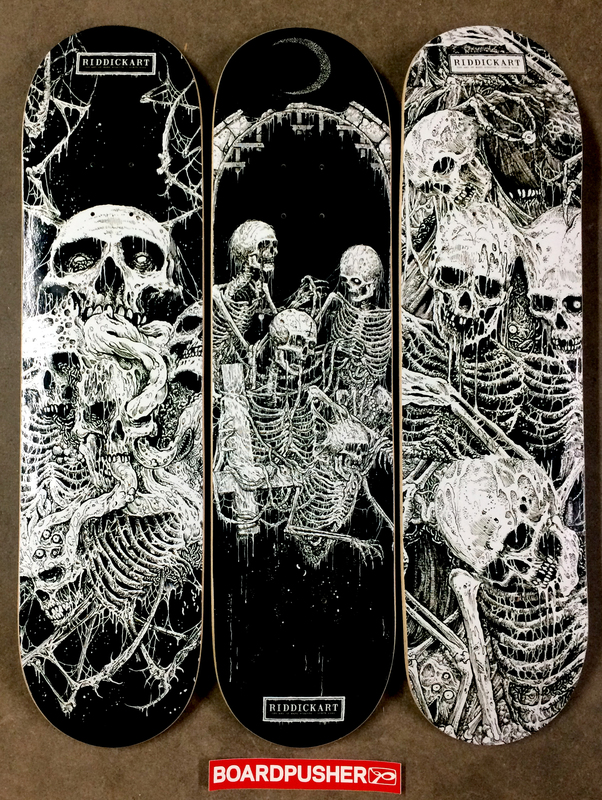 I did however admire the artwork on skateboard decks for a very long time and can remember thinking to myself, “I want to do that someday,” and now I am thanks to BoardPusher. I’ve been listening to heavy metal since 1986, but didn’t start getting into death metal around 1989 or 1990. I was introduced to the underground death metal scene in 1991 and I began tape trading and collecting demo tapes and 7” Eps from signed and unsigned bands from all corners of the world. What materials do you use to create your art? I use Sharpies and Sakura brand Micron pens and brushes to execute my illustrations. Sakura makes some amazing, precise, and quality products! You don’t have to say skateboards, but what’s your favorite medium to create for; album art, shirts, canvas, etc.? The bulk of my work is for T-Shirt prints so this would have to be my preferred product type. I’ve been producing more album covers as of late, however my art has been reproduced on other less conventional products like sweaters, shoes, backpacks, wallets, belt buckles etc. in the past. Skateboards are obviously a great medium too because it allows for a larger canvas area and can have a dual use as a deck or as wall art. What are some shirts and album covers we would have seen your artwork on? My illustrations have appeared on merchandise for bands like Arsis, Fleshgod Apocalypse, Nunslaughter, Morbid Angel, Grave, Exodus, Hypocrisy, Rotting Christ, Maruta, Autopsy, Dethklok, Kult of Azazel, Horrendous, and tons of others. Too many to mention. What influence, if any, does being a twin have on your art? My twinhood doesn’t have too much of a bearing on my artwork however, my twin brother is the only critic whose opinion I truly take to heart and value the most. My twin brother was kind enough to write the introduction to my next art book, Morbid Visions, out later this year, wherein he offers tons of insight into my working process, background, and vision as an artist. What’s the most recent challenge/project you’ve taken on? I’ve been drowning in requests as of late so it’s been difficult to keep up, especially since I have a full-time day job and obligations as a husband and parent, not to mention various releases from three different bands I play in coming out this year. One of my toughest clients has been this year, however I can’t mention it yet due to non-disclosure agreements, it’s extremely mainstream stuff. Some of the bands on my production schedule right now include Endseeker, Xternity, Whipstriker, Deranged, Hel, Heads for the Dead, Echelon, Well of Woe, Deathecho, Epitaph, Summer Breeze Open Air Festival, and some other things I can’t announce yet. We often tell new artists to just keep creating, share their artwork with their friends and get their opinions, and, like with most artistic endeavors, just keep moving to find your own voice and style and keep progressing. What advice do you offer artists who look up to your work? The most important advice I can give is to be passionate about your craft, stay motivated, be responsible and reasonable with your clients, be consistent in your branding and style, and take advantage of networking opportunities when applicable. Thank you for your time and support. Keep up the great work with BoardPusher, your service is an excellent outlet for all creative-types! 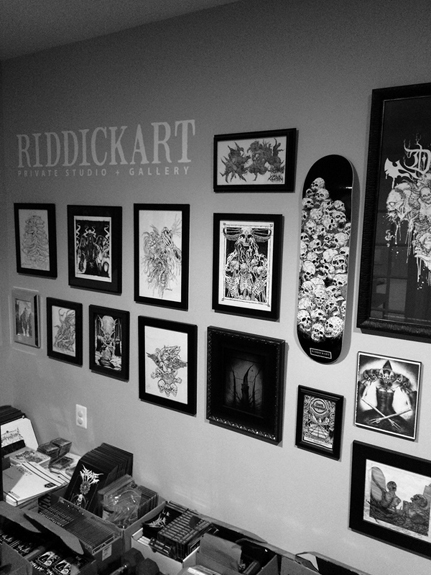 Visit Mark’s website at riddickart.com and check out his skateboard decks at BoardPusher.com/riddickart. Great interview this. Love Mark’s art and great to see it on skateboard decks and to learn about his working methods. Death metal and skateboarding and the art for both definitely have an anarchic commonality which is why they blend so well.